"The rush of modern civilization itself has raised for us new difficulties, new problems which must be solved..."
Seventy years after the week in which the death of President Franklin Delano Roosevelt shocked the nation and the world, it is easy enough to imagine the loss of America’s longest-serving and most-transformative president as history. In 1776 we sought freedom from the tyranny of a political autocracy—from the eighteenth-century royalists who held special privileges from the crown. It was to perpetuate their privilege that they governed without the consent of the governed; that they denied the right of free assembly and free speech; that they restricted the worship of God; that they put the average man’s property and the average man’s life in pawn to the mercenaries of dynastic power; that they regimented the people. Since that struggle, however, man’s inventive genius released new forces in our land which reordered the lives of our people. The age of machinery, of railroads; of steam and electricity; the telegraph and the radio; mass production, mass distribution—all of these combined to bring forward a new civilization and with it a new problem for those who sought to remain free. For out of this modern civilization economic royalists carved new dynasties. New kingdoms were built upon concentration of control over material things. Through new uses of corporations, banks and securities, new machinery of industry and agriculture, of labor and capital—all undreamed of by the Fathers—the whole structure of modern life was impressed into this royal service. There was no place among this royalty for our many thousands of small-businessmen and merchants who sought to make a worthy use of the American system of initiative and profit. They were no more free than the worker or the farmer. Even honest and progressive-minded men of wealth, aware of their obligation to their generation, could never know just where they fitted into this dynastic scheme of things. The whole point of the New Deal was to challenge the economic royalists on behalf of the great mass of Americans, and to establish that wider freedom. “The royalists of the economic order have conceded that political freedom was the business of the government, but they have maintained that economic slavery was nobody’s business. They granted that the government could protect the citizen in his right to vote, but they denied that the government could do anything to protect the citizen in his right to work and his right to live,” Roosevelt said. 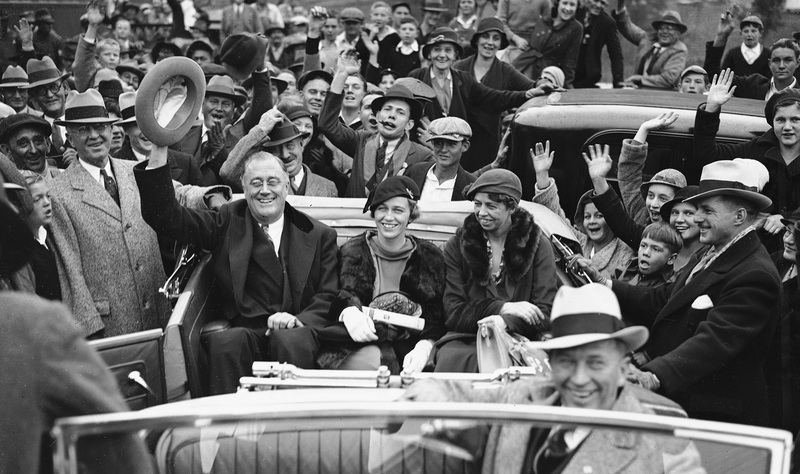 Roosevelt was re-elected that year, as he would be again in 1940 and 1944. He led the nation as it struggled to overcome a Great Depression at home and fascism abroad. But he never lost sight of the great struggle to overcome economic tyranny. To that end, he proposed a “Second Bill of Rights” that was, in its themes and purposes, as bold as the first. It was this “Second Bill of Rights,” an economic bill of rights, that he promised to pursue in the fourth term that was cut short by his death. “It is our duty now to begin to lay the plans and determine the strategy for the winning of a lasting peace and the establishment of an American standard of living higher than ever before known. We cannot be content, no matter how high that general standard of living may be, if some fraction of our people—whether it be one-third or one-fifth or one-tenth—is ill-fed, ill-clothed, ill-housed, and insecure,” Roosevelt told the Congress and the nation in the 1944 State of the Union address that framed the final year of his presidency. America’s own rightful place in the world depends in large part upon how fully these and similar rights have been carried into practice for all our citizens. For unless there is security here at home there cannot be lasting peace in the world. Seventy years after this country lost Franklin Roosevelt and the promise of a final term spent advocating for a realization of the “new goals of human happiness and well-being,” those goals have yet to be realized. The historian Havey Kaye has argued that President Obama should recognize Roosevelt’s vision and present it anew. The Roosevelt Institute and the Four Freedoms Center remind us that expanding and extending the debate about basic rights and democracy presents “a compelling vision for the future.” Vermont Senator Bernie Sanders has explored these possibilities with his “Economic Agenda for America.” Those are starting points, but they should not be the end of the embrace.